Hannah and her brother Theo are in the woods one day and find a magical item that grants wishes. With their wishes they change the world forever. 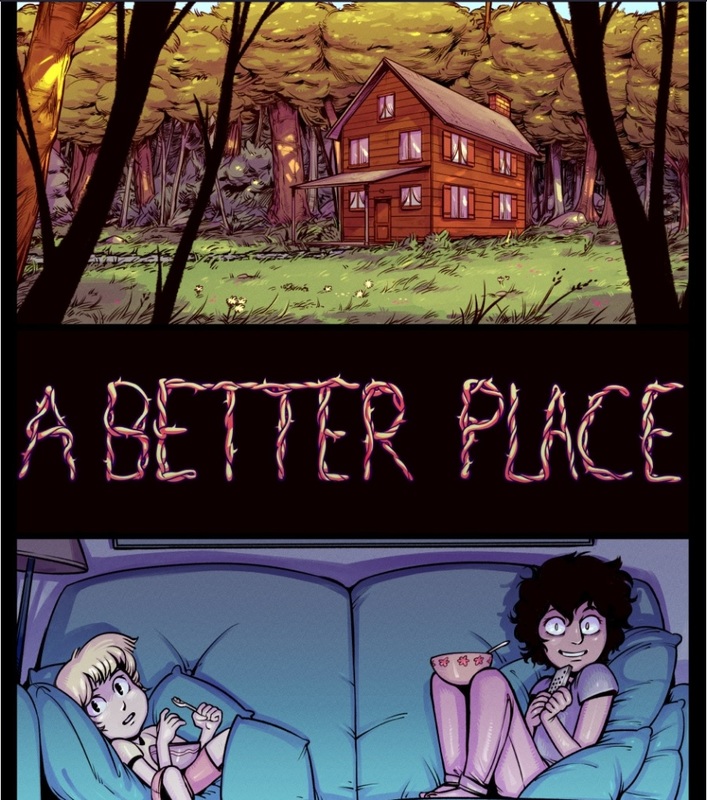 Abetter place is a fantasy, action comic by Harry Bogosian A.K.A harrodeleted. The story starts off flowing how Hannah and her brother stumbled upon the magical item that granted their wishes while playing in the woods by their house. Then it goes into the world that Hannah rules over as its new ruler and introduces one of the main characters that the story then follows Nina the trusted advisor of Hannah. This comic at times can be dark as characters die and there are dark themes that play a big part in the story. The characters in the story have their own agenda and will play others to get what they want to do to achieve their goals. Hannah before the wish was just a normal child that like T.V and loved her family. She did her own idea on how the world work and seem not to value smaller creatures live as much. After the wish it seem the power goes straight to her head. In the new world she seems to gain a bit of depression as things get more complicated as the ruler of a new world. Theo before the wish was just a happy little kid that loved adventure and superhero shows. After the wish he is locked away and isn’t very aware of the things that his sister is doing. He now must deal with learning what world his sister has made and what the creatures there think of it. Nina is a loyal advisor to Hannah in the new world that wants to protected the people but finds herself opposite of Hannah new plan for the world and tries to find a way to stop her. Nina is a caring person that doesn’t want to fight her creator but doesn’t have much of a choice now that the world is in danger. The art in the comic is drawn well and it alternates between black & white to colored pages. The designs for the characters are well done and feel like they would come straight out of a child’s mind. They do have a look to them that makes them feel like they are dangers creatures as well. This is due to the way the arties draws his character with more of an edge look to them. When action happens in the comic it is done with good detail to see what is happening. The panels that take place in big spaces nicely showing the power of these characters and they are given colors for there powers to give character a different feel in battle. Problems I saw with the comic is that the story sometimes glosses over things that happened off screen. Then you don’t know there real reason some of the character are motivated to do certain things. Sometimes it is hard to remember a character that hasn’t been seen in a while but there is not too many of those. That is going to happen though when there is a consistent cast of characters and there are new ones that need to be introduced into the story. The comic is still on going and have not flushed out all their characters yet. So it is fun to learn about new characters and the backstory on the ones that we have. The backstory on how Hannah changed the world is still somewhat of a mystery and is fun to get a glimpse at how it went down. This is a dark action heavy story I would recommend if you are a fan of darker fantasy stories. harrodeleted has another finished web comic that is quite enjoyable as well. Copyright 2017, Green Wing Comics. All rights Reserved.